I was very excited for Tussey. It was the first race, where I would need to travel and spend the night in a hotel. It's a nice drive up to State College, as it's very scenic from Philadelphia. You get a sense of the terrain as you pass the mountains, on the drive that makes up the "Mountainback" part of the race. Our destination was the Nittany Budget motel. The best, cheapest place, if you are thinking about doing this race and need a hotel. The other perk is that it's a bottle shop, to bad I couldn't drink, with the race the next day. After check in, we made our way to packet pickup, which was located at the Toffee Trees hotel. I thought maybe this would be an expo of sorts, since it's considered the championship race for 50M, but the race really isn't that large of an event. We grabbed a bite to eat at the Allen Street Grill, which was excellent and not too expensive. It was also next to a convenience store to grab some last minute race essentials. Once back at the motel, I tried to get some sleep, but the constant stream of cars to the bottle shop kept me awake. Someone also decided to let their motorcycle idle outside our hotel room for 10 minutes at 12AM. It didn't really matter much, as I wasn't going to sleep well, with the race constantly on my mind. Morning came and our breakfast was delivered via a double sided lock box accessible from outside. 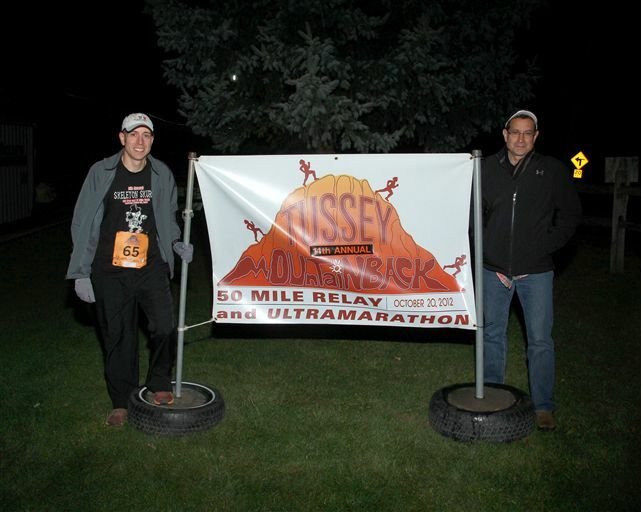 We headed off to the race start, which was at the Tussey Mountainback ski lodge. I said goodbye to my Dad, who was driving the support vehicles, and the race was off to a start. Looking back, it's both good and bad that they allowed vehicles on the course. Great when you can see your support at every check point, not that great when a car needs to pass every few minutes. Dad made the trip up to drive the support vehicle. It didn't take long until we hit our first climb and passed the first aid station. 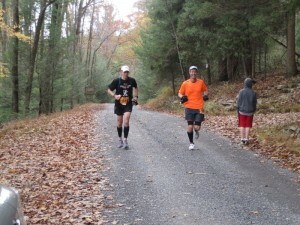 It wasn't that far into the race, maybe 3 or 4 miles that I met my new best friend for the day, Shaun Sauer. We got to talking and realized we both had around the same time goal for the race. The more we started talking we both realized the larger goal was just completion, and barring no major problems, we were going to complete the race together. Shaun's farthest run at the time was 27 miles, mine 31. We both had some doubts about what would happen once we were past the farthest distance we had covered in training. It's uncharted territory for any runner and you don't know how the body will respond. That was the part I was fearing the most, what was I going to feel like when I passed 31 miles. This would be where your mental preparation comes in, which should be a part of your training, but I'll post on that some other time. Running with Shaun, we just kept focused on the course and climbs that we needed to conquer. 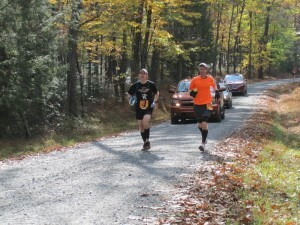 Both of us were in shock at the long hill in the middle of the course (2300FT from my Garmin). This was the hardest, longest climb I have run to date. 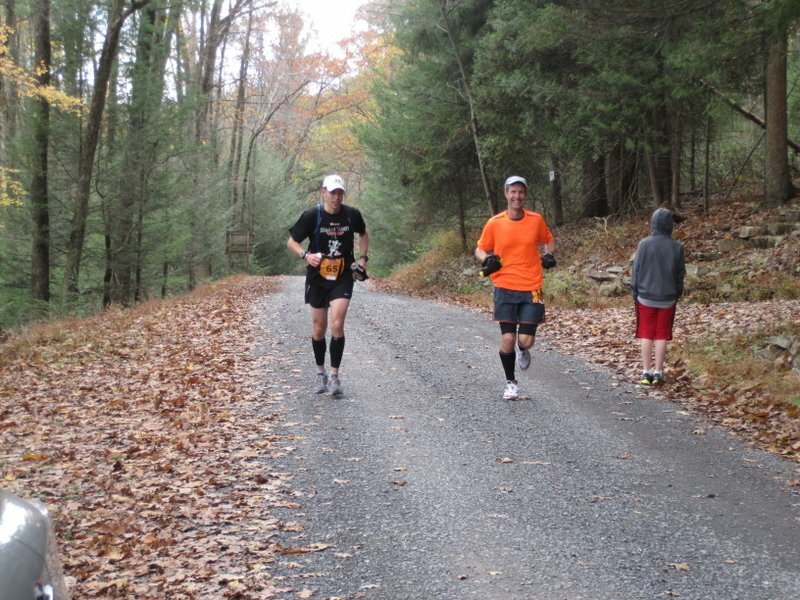 I would recommend hill training in your routine, at least once a week, if you plan to do this race. I used a hill near my house to do repeats once a week. The hill takes two minutes to climb, with about 100 ft of elevation. I also did long runs done on a pretty hilly trail system. The two differences between my training and Shaun's was that he did upwards of 70 MPW, and I felt he pushed the pace more than I did. The training plan, that I was on, had me at 50 MPW. In hindsight I'd say this wasn't enough, and at the time of the race, I regret not getting in more. I'm sure most people say the same thing after the fact, but I fit in as much training as my schedule allowed. As the saying goes, don't force it where it doesn't fit, and I definitely couldn't fit in any more mileage. I did get in multiple runs over marathon distance and think that was my only advantage. Also, my training had more technical terrain. 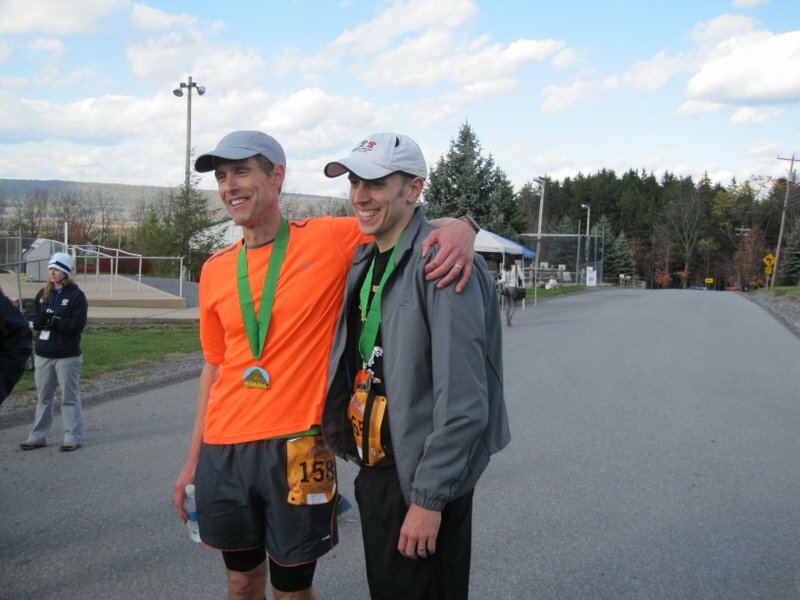 For Tussey, I would call this more of a road race than a trail race. 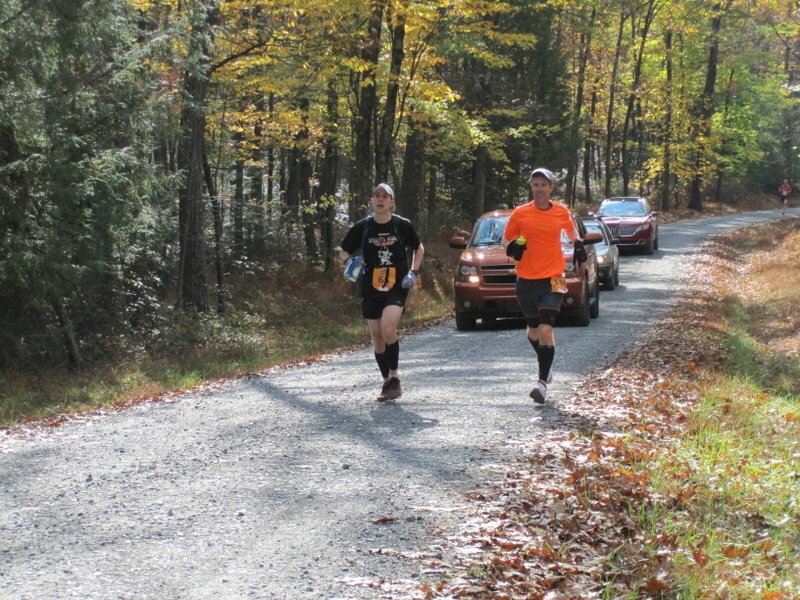 This is a perfect first 50 mile race because it's not rocky or difficult terrain. Personally, dealing with the distance was tough enough, so I didn't want to add technical terrain on top of that. 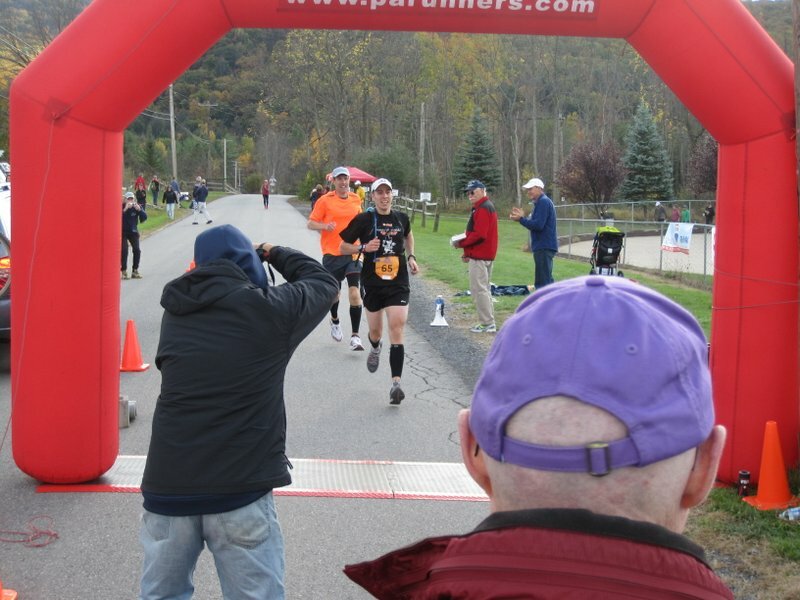 For me, the race became a death march around mile 36. I developed a blister on my pinky toe, that caused pain with every step I took. I decided to change shoes because I could feel the hot spot coming on at mile 27. I put Vaseline on it, which seemed to help for a few miles, but didn't completely resolve the issue for me. At two different aid stations, I had to cut the blister to relieve the pressure. It was still painful but bearable. I did try to patch it with moleskin, but it didn't seem to stay on my toe. Next time I would try to prep with more body glide. I have also picked up some feetures socks since then to avoid this in the future. In training I had zero problems with blisters, but I never ran farther than 36 miles. Allowing cars on the course is both good and bad. It's nice that you get to see your support crew at every aid station, but having to deal with cars passing every few minutes was annoying. If I had to choose, I would say it's still more of a benefit. 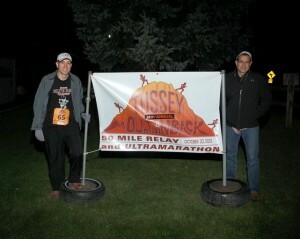 It was nice to be able to tell my dad something as he drove past, and he would have it ready at the next aid station. This is also necessary for the relay portion of the race, so I understand why it's needed. For the last 10 miles of the race, we switched to a run/walk combo. Almost everyone that I know that does an ultra walks at some point. In your training you should practice walking fast. It's a tool you can use to give your legs a break. We reached the final aid station, which is 5 miles from the finish, and my last chance I had to check my blister. I cut it again to relieve the pressure and try to put some moleskin on it. I picked myself up, and joined Shaun after he met with his wife for the final time. This was the last leg of the race and it was all downhill. We pushed the pace as much as we could, but my quads, at this point, were destroyed. The pain was horrible, so much that it was really turning me off wanting to attempt something like this again. I just couldn't wait for this thing to be over, I felt so much of relief when I turned the corner and could finally see the finish line. I asked Shaun if he was going to go for it and, and one second later we started sprinting toward the finish. Behind us I could see there were two runners that were gaining on us, and then, finally it was over. We crossed the finish line in 8:26:33. This was faster than I thought we were going to run it, and a great time for my first, and possibly last 50 miler. I could not imagine having to do this race alone, I actually think I had such an advantage with having a running partner. It's less time you would have to listen to your own internal monologue telling you, "This is painful", "Please stop", "Why are you doing this?". If I had to do it again, the only thing I would change would be upping my weekly mileage to 70-80MPW. I think that played a big factor in the amount of pain I was feeling in the end. My final thoughts on this race/distance is that it takes a ton of time to be competitive. More time than I'm willing to commit, I'm happy with the 50K distance. I'll try to perfect my 50K before I would ever attempt another 50 miler. I keep going back to my first experience at Blues Cruise, and nothing compares to it. So for next year I think that's going to make that my main focus and set a goal to place in the top 10. There's three people I have to thank for my big success at this race. First, it's my wife for giving me the time with a newborn to train for this race. Second, it's my dad for making the trip up to State College to support me. Finally, it's Shaun for running an entire race with a complete stranger. 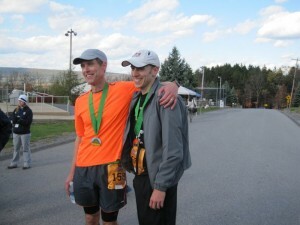 This was the most difficult race I have ever run, but running with Shaun made the experience easier. It did not feel like 8 hours when the race was over. His support helped me through some really tough patches during the race. He said I did the same for him, so I'm glad that I could help him achieve his goal. I really don't think I would have completed this race otherwise when the pain became almost unbearable. Running is not a solo sport when you think about it, it can be a team effort. So if I didn't have my wife, Dad, and Shaun helping me I could not have completed this race. Post race I didn't really like their food selection. The soggy hoagies from Subway didn't taste that great, but they did have live music and beer which was great. I quickly proceeded to burger king to get a greasy burger and fries with a tub of coke. I was pretty sure I earned it since I just burned upwards of 7500 calories. Overall, this race provided me with a very enjoyable first 50 miler experience. So if you are looking for your first 50 that's not extremely difficult I would say pick this race for sure.